Can you travel Europe on 5 dollars a day? A couple of weeks ago, I wrote a series of articles about how to travel Europe on a budget. But never have I mentioned what I consider “budget”. Accidentally, a couple of days after finished the last article in the series, I’ve stumbled upon a post on the topic. It turns out there is this book, an old book, called Europe on 5 Dollars a Day. Its a guide book, the very first published by Frommer, back in 1957. Apparently, it is a very influential book, and people still try to follow the routes around Europe proposed by Frommer, getting all worked up about how expensive everything’s become (like a room at the Ritz in Paris). So what’s the score – can you, indeed, still travel Europe on 5$ a day, and if you can’t – how much do you need? In the first part of this post, I’ll deal with the 5$ issue, and in the second part, give my personal, unbiased and statistically validated opinion on what is the budget that you’ll need to travel in Europe anno 2014. Part 1 – can I travel Europe on 5$ a day? Well, if you only hitchhike or walk, sleep on people’s couches, sneak into museums and steal food, you can. But that is an answer to the question “can I live as a bum in Europe?” not “can I travel Europe?”. There are, in fact, 2 issues with the “can I travel Europe on $5 a day?” question. Since its $5 from back in 1957, there is 1 – the inflation that has to be taken into account, and 2 – the exchange rates. Estimates of inflation vary, depending on the way of measuring it and what you are actually buying. The variation is rather extreme, as $5 in 1957 is worth between $31.50 to $171.00 today. If you’re interested in the details, you can check http://www.measuringworth.com/. Comparing exchange rates over half a century is even more difficult, as many currencies have been devaluated, merged into the Euro or disappeared all together, sometimes with the issuing country, like the Czechoslovak Koruna. The Swiss Frank is a rare example of a European currency which has not been subject to all these perturbations. In 1957 you’d get 4 Swiss Franks for 1 dollar, and today you get just one. Comparing exchange rates with the Euro is more challenging. Taking the German Mark (DM) as an example, we’ll see that $1 would buy 4.2 DM in 1957 and today $1 buys 0.75 Euro (or 1.5 DM) – about 3 times less! So taking the exchange rates into account, to get what you’d have for $5 in Europe in 1957, you’ll need $100 to $500 today! I don’t think that counts as “budget travelling” anymore. Another issue with attempting to travel the same routes as proposed by Frommer in 1957, is that most places mentioned in Europe on 5 Dollars a Day have been closed and the ones that survived became hugely popular with $-rolling American tourists thanks to that very book! This popularity has driven prices beyond general inflation rate and, in fact, beyond any reason. So, no, you can’t travel Europe on $5 a day. Well, perhaps if you only visit Moldova. Part 2 – What is the minimal budget to travel Europe? Not $5. That was made clear in Part 1. And in fact, since I live in the Eurozone, and most travellers in Europe spend at least part of their travels in Euro countries, I’ll stick to Euros if you don’t mind. The exchange rate you can find yourself at Oanda. Back to the budget – can I travel Europe on 25 Euro a day? Yes, you can! It will take some effort – booking tickets in advance and avoiding expensive cities (Paris), countries (Switzerland) and regions (Scandinavia). Also, to stay within this tight budget you’ll probably have to do a lot of Couchsurfing and cook most of your own meals. Spending an average of 50 Euros a day you’ll have a bit more comfort and choice. It will still require planning and self-control, but on 50 Euros a day you can buy yourself an ice-cream if you want to, go to a museum even outside the free hours and there is no reason why you’d have to avoid whole regions – just don’t buy alcohol anywhere in Scandinavia, as it will butcher your budget right away. Conclusion – no, you can’t travel Europe on $5 a day. But you don’t need $500, either. Depending on your luxury standards and destinations, between $25 and $100 will probably do just fine. Europe as a budget destination – part V – what to do there? In the first post of this series, I’ve bundled the travel issues into 5 categories: “Where to?” , “When to go?”, “How to get around?”, “Where to sleep?” and “What to do there?” Having dealt with the first four questions, I now get to the best part – the fun stuff to do in Europe on a budget. Now I know Europe is famous for the amount and quality of attractions, like museums, churches, beaches etc. And you can save, for example, by visiting several museums in one day on a city pass, by doing what I call a “museum run”. However, when on a budget, its nice to have a few fun options that cost virtually nothing. The following 3 are my personal favourites. Europe is the best continent for hiking. Period. Nepal, New Zealand, New Mexico, all are great hiking destinations, but hiking in Europe is just so much easier. Every country in Europe, large or small, offers a vast array of well-marked hiking trails of every degree of difficulty and length. There are fully equipped, clean campings all over the place. If you don’t feel like camping, a mountain cabin is usually available. And if you’re tired of hiking, civilization is just a couple of hours away even in the remotest parts of Europe. This doesn’t mean you will hike among hordes of people (like on the Around Annapurna trek or on any of the Great Walks of New Zealand). Even slightly off-season (in June or September), in a bit less touristy areas (Pyrenees or Scandinavia) or on not-the-most-popular-paths you will be mostly by yourself. Best part – hiking is for free. The tram is my favourite vehicle and is a distinctly European mode of transport. Trams are virtually non-existent outside Europe. Unlike the metro, the tram runs above ground, so you don’t get claustrophobic. Its on rail, so it doesn’t veer like the bus does (buses always give me nausea). You’re inside a tram so you don’t get wet like you do when cycling. Finally, the tram offers a great view with zero effort, and tram routes usually go through cool parts of town. Buy a day ticket – it’s a great (budget) way to get to know a city. Just hop on, ride all the way to the suburbs, step out at the end of the line and have a walk in the park – usually there is a park where the line (and the city) ends. Then go back to the tram and go back. If still in the mood, repeat, using another line. Congratulations, you’ve just had a great day of sightseeing for about 5 euros. Probably met a few locals on the tram, too. Yes, this one is, again, not unique to Europe. But while backpackers all over the world spend their time in hammocks, the ones in Europe seem to be rushing from museum to church to party, with never a dull moment in between. European distances are, indeed, relatively small and the attractions are innumerable, but taking a day or two off your travels is as good an idea in Europe as it is anywhere else. Give yourself a rest – the museum will still be there tomorrow, the church has been there for 800 years and will wait, and you still have a hangover from yesterday’s party. Stay in your hostel (or with your Couchsurfing host), have a walk in the neighbourhood without actually going anywhere, read a newspaper in the local library (most have newspapers in English) or a book, even if its your Lonely Planet guide. Perhaps you might end up reconsidering your next destination or decide to stay longer where you are at the moment. Having a break can and probably will save you money, short- and long-term. If you don’t have a book – why not buy one? A visit to a local book store can be quite interesting, even if you don’t end up buying anything. Especially if its anything like this one, located in a former church in Maastricht. This sums up my series of posts about budget travel in Europe. As usual, if you have any tips of your own, or anything to add to the ones I wrote, you’re welcome to leave your comment here. Happy travels! Europe as a budget destination – part III – how to get around? An essential part of travel is… the actual travelling. Unless you’re on a city-trip, at some point you probably want to get from A to B. Admitted, some routes are more spectucalr than others, and not all ways of transport are equally pleasant. But getting around can be part of the joy of travelling, and even in Europe it doesn’t have to be expensive. The major destinations in Europe are well-connected by budget airlines and the excellent European train network is rightfully praised. However, in some parts, like the Balkans, bus is the major mode of transnational travel. 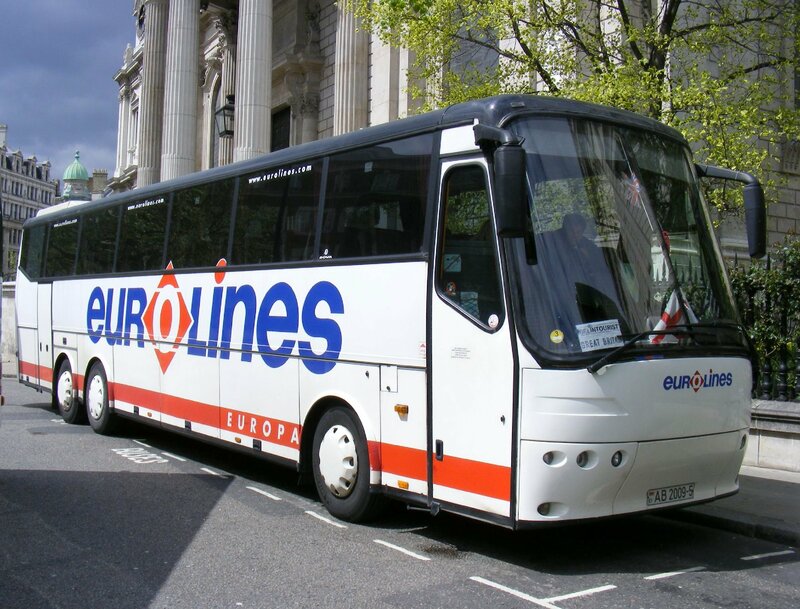 But even in better-connected parts of Europe the transnational buses of Eurolines are a very valid alternative for the budget-minded traveller. For example, say you want to travel from Amsterdam to Frankfurt. The cheapest flights are at least 90 Euro, train tickets start at 59 Euro but the bus costs just 25 Euro! Sure, 8 hours by bus is longer than 6 hours by train, but it does save you 35 Euro. And on shorter routes, like Amsterdam-Brussels, the margin is even greater (9 vs 29 Euro for the cheapest tickets and the train is only an hour faster). What? Renting a car? How’s that a budget mode of transport? Well, under certain conditions it is. First of all, if you’re going to remoter destinations, or off the beaten track, renting a car can be even a necessity. Secondly, since trains in Europe can be quite expensive, if you travel in a group, or moving around a lot, renting a car can turn out to be cheaper than train or even bus. “Group” doesn’t mean you have to squeeze 5 guys in a small-sized vehicle, the break-even group size is usually between 2 and 3. This means that even for a couple, renting a car can be a budget option and if there’s 4 of you, don’t hesitate to rent. Finally, car rental is about the only thing in Europe that is cheaper outside the peak season of July-August, and the differences can be significant. Check the prices in different months – it might pay off to postpone your travel by a couple of weeks, to save hundreds of Euros on the rental vehicle. Our (budget in the off-season) rental car in Borgarfjörður Eystri – Iceland’s remotest point. We’ve visited the local church. It was for free. And unlocked. This is for the more adventure-minded travellers. For women its probably not the best idea to hitchhike alone even in the safest countries. Generally, standing by the roadside with a board or the thumb up is not a good way to hitch a ride. Go to a gas station and engage in conversation with people you want to give you a ride. Smile a lot. Learning a few words in the country’s language, even if only saying “Hello, how are you”, is essential for breaking the ice. Ask people politely where they are going and if they would be ready to take you with them. While hitchhiking took me once from Vienna to Eindhoven in just 10 hours, be prepared for the worse – like getting stuck on a dead road for a whole day. Fortunately, in the modern hyperconnected world, there are special websites like www.carpooling.com or its local sibling www.mitfahrzentrale.de, where you can find a ride in advance (maybe while paying part of the gas costs). Additionally, Couchsurfing groups are a great way of getting in touch with other travellers, that may want to join you in hitchhiking, share gas costs or just give you a ride. Happy hitchiking and stay safe! Well, now you know where in Europe to go to on a budget, how to find a cheap place to sleep and how to get from A to B. Next time – the all essential question of when to go if you want to be able to travel Europe for 30 Euros a day (and I promise not to forget to tell you what you can actually do in Europe on a budget). Europe as a budget destination – part II – where to sleep? OK, so you’re in Europe. Whether you are in a big country or small, North or South, rain or shine, at some point you need to get some sleep. And getting a place to sleep can eat quite a big chunk out of your budget. Fortunately, even in (relatively) expensive Europe there are good budget sleeping options, that sometimes throw a unique experience into the bargain. I probably am not shocking anyone by telling about Couchsurfing (or CS for short). In case you’ve missed out on this one – its a way of getting a place to sleep on someone’s couch. CS itself is just the largest and most well-known of a number of similar clubs. The concept is simple – you make an account on a website, tell a bit about yourself and send potential hosts a message asking whether they will be kind enough to host you when you’re around. I’ve had some amazing experiences with CS, both hosting and staying, and a couple of not-so-great-but-still-better-than-a-hostel experiences. In case you’re freaked out by the idea of going to spend the night at a random stranger’s place, try going to a meeting of your local CS group, or perhaps use CS in your home town before you go. Besides a free place to stay, CS is a great way to get to know the locals and join them for some cheap thrills, like going to a Death Metal club in Glazgow, wine tasting in an Italian village bar or speed boating on Lake Luzern (all done by me via CS). If you like to get your hands dirty – why not go WWOOFing? Here the concept is a bit different – you get food and lodging in exchange for a few hours (4-6) a day of work on an organic farm. In addition to free accommodation you get a unique experience and an opportunity to learn new skills. WWOOFing needs an initial investment – to get the information about potential hosts, you need to pay a membership fee for the WWOOF charter in the country you are visiting. A way of circumventing multiple fees if you want to WWOOF in multiple countries is to get membership of “WWOOF independents” – countries where there are just several hosts and that don’t have a national group (in Europe this includes Albania, Bosnia, Croatia, Cyprus (Northern), Finland, Georgia, Iceland, Latvia, Luxembourg, Malta, Montenegro, Netherlands, Russia, Slovenia, and Ukraine). OK, so maybe not all WWOOFing locations look like this. Let’s just say that I just know what to choose. Most European cities have a camping nearby or even within city limits. Especially in the summer months, camping is a cheap alternative to staying in the crowded, damp hostels. Even more remote campings sometimes offer pick-up and drop-off service from the nearest train station, so you don’t have to have a car to go camping. And did I mention that even in pricey Switzerland camping fees cost just 5 to 10 Euro? In addition, in less crowded areas of Europe (and there are plenty), you can just pitch your tent out of sight for free! By the way, camping does not necessarily mean that you have to pitch your own tent – many European campings offer places in already pitched tents, dorm-style. There are family tents as well, or, if you want more comfort, caravans. Mind you, these are only the free or almost free options. If you’re less adventure-minded you can find a cheap hostel or book a hotel well in advance (or off season) and get a great deal. But as you now know, even if you’re on a tight budget you can still get a good night sleep, sometimes in really cool places, too. Next time – the essence of travelling – how to get from A to B on a dime and a penny. Europe as a budget destination – part I – where to? December is an expensive month. The gifts, the travel, the meals, the party’s all cost a bunch. Come January and you’re left with a huge financial hangover on top of the common one, with the European vacation you’ve been eyeing for this summer further out of reach than ever. Europe as a continent does not enjoy the reputation of being a “budget destination”. Totally undeservedly, if you ask me. I’ve spent years roaming around Europe as a penniless student and I can tell you that if you do it right, there is no reason why you shouldn’t be able to tour this beautiful continent from end to end on a reasonable budget. And over the next few weeks, through this weblog, I am going to tell you how. Assuming you don’t go on an organized tour but want to travel on your own schedule, taking your time, I promise you that if you keep reading, you will discover that Europe too can be a budget destination. When travelling, or thinking of travelling there are a number of topics to consider. Usually, these can be divided into the following: “Where and when do I go, how do I get around once I am there, where do I sleep, and what do I do while I am there”. There is, of course, the “how do I get there” question, but my guess is that you’ll be perfectly able to figure that out by yourself once you’ve settled your mind on the “where and when”, so I’ll just ignore the “how to get there” part and start with “where do I go”. If you are going to Europe on a budget, first of all, don’t go to “Europe”. Its just too big and too diverse to cope with, especially on a budget. Go to “Europe” and you’ll end up getting lost in the maze of countries, currencies and customs, “seeing” a lot but experiencing only frustration and lack of time. Is there anything you can do? Yes, you can! Big European countries, like Spain, Italy or France are home to a great diversity of landscapes and regional cultures. If you spend most of your time in a big country, not only will you save on buying one guide book instead of many, you’ll profit from getting familiarized with the local transportation system, knowing which supermarket chain is the cheap one and so on. You may even learn some of the language and if you get bored – most big countries have many neighbours, making day trips to other countries a piece of cake. Maybe not the cheapest part of Europe, but staying in the uniform currency area will save you the hassle and costs of changing money at every border. Getting used to the exchange rate can prevent costly mishaps, saving you more than you would think. And a Eurozone country is not necessarily expensive – Estonia, Slovakia, Malta, Portugal, Slovenia and as of 1st of January also Latvia are all using the Euro and are comparatively cheap. The West and North of Europe are rather expensive and travelling in the East is difficult (and expensive) due to large distances and language barriers. Plus, countries like Russia or Ukraine lack facilities for the budget traveller such as hostels and campings. Staying in the “golden middle” will keep you from overspending while allowing you to enjoy excellent facilities and relatively short travel distances. The only problem is – what is Central Europe? I think it can be limited to members of the EU that have been behind the Iron Curtain. Just check any list of “cheapest European cities” and you’ll find most of them fit the definition of Central Europe I propose. Seemingly, the advice I just provided is contradictory, as there are no large countries in Central Europe that use the Euro. But I never said you should fulfil all the conditions at the same time. Besides, perhaps you’ve forgotten a country? What about Germany? Its big, it uses the Euro and its as Central European as it gets – even the geographical centre of the EU is in Germany. And, of course, a large part of Germany was behind the Iron Curtain – the Berlin wall must count for something! Plus, don’t forget that Berlin is one of the most affordable cities in Europe. Hope this gives you inspiration and confidence that Europe is doable even on a tight budget. Next time I’ll share some tips about where to sleep cheaply (or even for free). And if you have budget tips of your own, your comments are welcome! Happy travels! Many weblogs about Europe are by backpackers travelling around the continent. And many backpackers are on a budget, both financially as in terms of weight. Since I’ve got a wealth of backpacking experience in Europe and beyond, I have decided to share my wisdom with the world, and enlighten the backpacking crowds on some backpacking essentials. Hear hear the wise words of the backpacking guru! Get a buff – this simple piece of cloth is amazingly versatile. Its like a towel-plus (see The Hitchhiker’s Guide to the Galaxy on the towel issue). You can warm your head with it, pick up hot pans, cover your eyes on a plane or even wipe your… uhmm… nose. No limit to what you can do with a buff. Crocs. Yes, they’re ugly. But they’re so ugly they’re cute. Well, at least they’re better than Uggs, that’s for sure. Certainly more useful. Light, fast-drying and wearable with socks, too (I don’t do that outside mountain huts, honest). They don’t cost less than 10 Euros you say? Who said anything about buying the originals? Earplugs. Not the item to get cheap on, so spend some effort in getting good ones. I mean, people snore. And some people SNORE. And for some reason they always end up in your dorm. Good ear plugs have saved many lives. Of snorers who would otherwise be… let’s say… made quiet. Next time – the not-so-cheap backpacking essentials. Stay tuned!